"Endlessly malleable for every need, the frontier has far more power as an ongoing story than it did as an actual experience." "Frontier nostalgia is often mixed with anxiety. People yearn for the things they annihilate." "Remodeling what was often a dirty, brutal, chaotic experience into the cleanest, happiest, most predictable place on earth became [Disney's] mission." 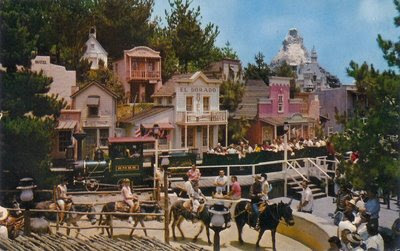 "Frontierland was carefully choreographed so that guests could feel they were actors in a movie... Replicas of nature meant to be more satisfying than the real thing, such perfectly predictable adventures supply a sense of mastery and reassurance." "today's monotone enclave is a shelter from the multicultural world swirling around it... A soothing realm of safe adventures, Frontierland offers sanctuary from the true frontier of ethnic interaction and raucous uncertainty that roars beyond the berm in the streets of Anaheim and throughout Southern California." "Frontierland and Tomorrowland represented a tug of war between the glorious past and the promising future .... This dynamic relationship has sagged ever since." Disney strived to make us "forget about the death of the frontier and our complicity in that process.."
What does it mean that Disney bulldozed small-town Anaheim in order to build his nostalgic replica of small-town America? Does it matter that Disney's mania for control means that workers are not allowed to wear non-white socks, grow hair below their ears (for men), or otherwise deviate from the image of cleancut 1950s teenager that the Disney corporation seeks to promote? How does Disney "allow us to safely reenact the myth of redemption in the wilderness, airbrushing powerful ambiguities that haunt this gripping story"? Why did Disney shift from hiring a few non-white performers in subservient roles in the 1950s (Aunt Jemima, Zoro, a mariachi band, and Indian dancers) to, by the 1960s, promoting a "race-neutral" all-white-appearing cast, with dancing Indians replaced by dancing robots? Why do Europeans and Asians literally buy this image of America? "The pyramids of buffalo skulls and rusted automobiles; the corpses stacked like cordwood at Block Island and Wounded Knee; the dust bowl and the mushroom cloud -- such painful features quickly dissolve in favor of the ever-compelling vision of America as 'a geography of hope'..."
The challenge is to remember those pyramids of buffalo skulls while also carefully analyzing the power of Disney's whitewashed frontierland. I am looking forward to your discussion-board postings on this subject. Interesting post (and blog!). I came across it while looking into Disneyland's relationship with nostalgia culture (I'm writing a paper on this topic in an anthro seminar on heritage and tourism at CSUN). This is the blog for Cal State Fullerton's online class, American Studies 101. If you are not a CSUF student in AMST 101, please leave a comment telling me who you are. I am curious to know who else is reading this.